Welcome to our official 2019 rankings for Top 10 Study Abroad Countries in the World! #10 on our global rankings is the home of Vegemite, kangaroos and koalas - Australia! With six of its universities in the Top 100 worldwide, we awarded it an impressive #4 in the entire world for best countries for education. But students will have plenty to enjoy outside the classroom too! Besides the draw of big cities like Sydney, Melbourne and Brisbane, Australia is unique in its range of habitats, from rainforests and deserts to alpine mountains and underwater ecosystems, attracting a diverse range of animals and wildlife both on land and in the ocean. We rated Australia #7 in the world for adventure and it’s easy to see why! Whether you are going on an expedition to the Outback, taking a trip along the Great Ocean Road or diving in the depths of the Great Barrier Reef, Australia has something for everyone! As a country famed for its stylish fashions, breathtaking French Riviera and the enchanting Notre-Dame Cathedral amongst so many other attractions, France sits at the top of most people’s bucket list. 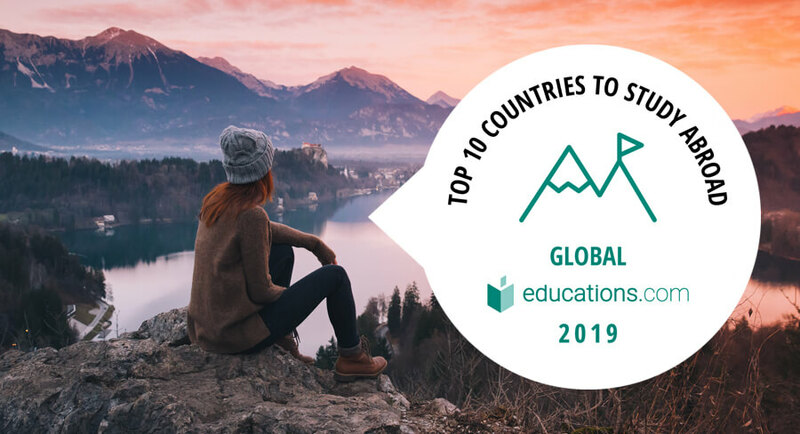 With a prestigious education system, and more than 3,500 higher education institutions to choose from, more and more students are considering this historic and captivating country to study in. Ranked #3 in the world for culture and #11 for adventure, you can experience everything from the cozy warmth of a snow cabin in the Alps to the glitz and glamour of Cannes. Study abroad in Switzerland and join some of the happiest citizens in the world! Switzerland has so much to offer. For education, we ranked it #2 in the world for teaching quality and #6 for career goals. Pretty impressive for a small country, especially as it also boasts two of the world's highest rated universities! Inside the classroom, critical thinking, interactive learning and active debating will be at the core of your learning, supplying you with skills that will take you far in whichever career you choose. In your study breaks, get ready to ski in the splendor of the Swiss Alps, wander through majestic fairy tale castles and savor the taste of some of the most delicious chocolate you can find! Why not join the Swiss and earn a top degree in this stunning, safe and sweet-filled haven! At #7, the Netherlands has also scored #3 globally for teaching quality and #4 for career goals. For such a small country, having eight universities in the Top 100 in the world is an impressive accomplishment! Choose from over 2,000 university programs taught in English, and enjoy an interactive and student-centered style of teaching that will set you up with skills for life! Many international students choose to study here and the country enjoys a diverse international community. Plenty of graduates choose to remain in the country after graduation, too. Although excellent government initiatives play a big part in this, it could also be because they don’t want to leave behind the spectacular beauty of the tulip festivals, artistic offerings from the home of Rembrandt and Van Gogh, and the progressive, healthy and balanced lifestyle of the Dutch. Costa Rica comes in a strong #6 in our global rankings. Thanks to its wild landscapes and extreme sports to explore, the country has scored #2 in the world for adventure #2 for finding friends. Costa Rica is a vibrant nation that is home to a very proud and peaceful population, making it well known for being one of the happiest countries in the world! Perhaps it’s the well-known gourmet coffee beans the country produces, the wonderful ‘Pura Vida’ attitude to living that Costa Ricans pursue or something else entirely. With over 60 universities to choose from, a broad level of respect for education throughout the country, and affordable living costs, Costa Rica is a great place to get your degree, too! Mexico is consistently a favorite with expats due to its fantastic climate, low living costs and welcoming locals. It’s the perfect place to study and live; coming in at an impressive #1 in the world for finding friends and #3 for adventure. Discover the secrets of the ancient Aztecs and Mayans while enjoying the modern cultural and artistic heritage the country has to offer! At #10 worldwide for culture, you won’t be disappointed! Outside of the cities you also have 35 UNESCO World Heritage Sites to explore as well as a myriad of mountains to trek, beaches to enjoy and rainforests to explore! Take this opportunity to learn a new language, enjoy some authentic enchiladas and experience the electrifying festivities of Dia de Los Muertos, and make your study abroad trip one to remember! As the world’s most educated country, Canada proudly features top universities and was rated an impressive #4 in the world for teaching quality and #8 for career goals. Outside of the lecture room, you can get swept away by the beauty of Niagara Falls, trek one of the many mesmerizing national parks or meet a polar bear in Churchill! As a country known for its diversity and inclusive values, studying abroad in Canada will be easy to adjust to, and you’ll get to experience the high standard of living that locals enjoy. Canada is internationally recognized as one of the best countries to live and study in, so what are you waiting for? You’ve probably heard of Thailand being a great place for a vacation, but could it be your next study abroad destination? 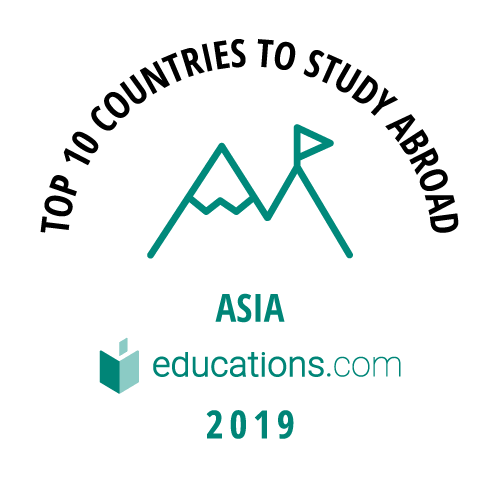 As our #3 study abroad destination in the world (and #1 in Asia), and with top global rankings in culture (#8) and adventure (#8), Thailand offers so much more than a typical beach and resort holiday. Just imagine yourself attending university while taking study breaks enjoying the picturesque scenes of floating markets, gorgeous temples and palaces! With a low cost of living, delicious street food, universities that rank among the world’s best and an amazing climate to enjoy, living and studying in Thailand is a dream come true! Thailand is also home to some of the friendliest and happiest people you could meet (it's not known as the ‘Land of Smiles’ for nothing!) Whether you are attracted by the legendary and thrilling nightlife of Bangkok, or the tranquil, stunning shores of Koh Samui, you can be guaranteed that you’ll have the time of your life! Earning the #2 spot in the world (and #1 spot in Europe), Spain makes for an irresistible choice for your study abroad destination! With low living costs, an excellent education system and over 70 universities to choose from, you’ll be spoiled for choice of where to further your education in this sunny, historical and beautiful country! Outside of your studies you’ll never be short of something to do either, which is why we ranked it an impressive #1 in the world for adventure and #3 for culture. Whether you’re sampling tapas on the Spanish sidewalks, admiring the artwork of Picasso and Gaudi or cheering on Real Madrid and Barcelona in their home stadiums, you will be guaranteed to have an amazing experience if you study abroad in Spain. Are the Kiwis onto something? The answer is YES! With so much to offer, New Zealand proudly claims our #1 study abroad destination in the world! You may have already heard of its stunning natural splendor, abundance of adrenaline-filled extreme sports and scenic trails made famous by the Lord of the Rings trilogy. But did you know that you can get a first-class education here as well? With all of its eight universities in the top 3% in the world, New Zealand quite rightly deserved the top spot, along with #2 for career goals and #6 for adventure. Study here and you will always find fun activities to try, whether you want to ski, sail or skydive! Your adventure starts in New Zealand.